Something I do to make lunch time a little easier is grill a few chicken breasts to last me the week. With the weather warming up and longer days, it takes quite a bit of effort to bring myself indoors when I can be out gardening, mowing the lawn, or, my favorite, laying in the hammock reading a book. Recipes are a lot more fun if you have a well stocked fridge and you can make it up as you go. And that is just what I did. 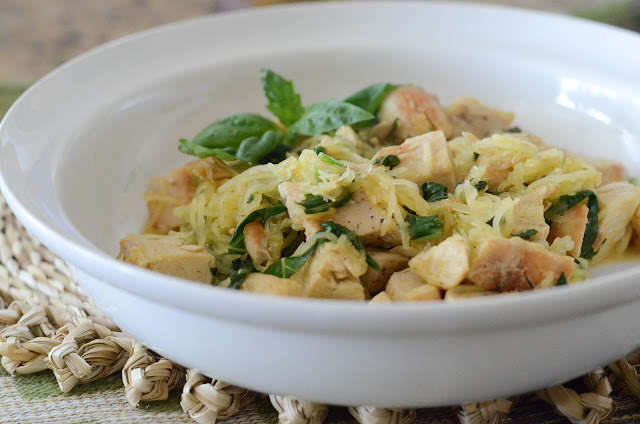 I had cooked a spaghetti squash the day before this recipe, meaning to use it that night, but ended up doing something else. I also had picked up a big bunch of fresh basil as mine are still in the baby plant stage awaiting transplantation into my garden. Heat the oil in a large saute pan over medium high heat. Add the chicken and cook until warm, about 3-5 minutes. Remove the chicken, set aside and then add the wine and reduce by half. Add the stock and lemon juice, cooking until reduce by half again. Add the ghee, whisking as the ghee incorporates into the liquid. Salt and pepper to taste. Reduce the heat to medium and put the chicken back in the pan along with the basil and squash. Using tongs, mix and stir, cooking an additional 3-5 minutes so all the ingredients are heated through. Salt and pepper to taste.